I wrote a while back that the last 12 months has seen Social Media move from a why idea to a how idea. Brands are no longer questioning the use of Social Media, they are starting to question how to use Social Media. Whether they like it or not the conversations are happening, and brands are now realising that the question is whether or not to participate, not whether or not to create. So what's my point? Well, my point is that Social Media campaigns either rely on large populations to enable sufficiently large target markets to make Social Media viable, or target huge generic demographics (all women, or all under 50's) that can be achieved in smaller overall populations. Generally speaking though, people often fail to see the ways to effectively use Social Media without either of these situations. Social Media is about creating content and engaging in conversations where your target market is - if all your potential customers use Facebook, then you engage with them on Facebook. But consider that instead of creating the content and driving the conversation yourself directly to your potential customers (who very few may be active within Social Media), you entice others to do it for you. You instead target a very small, specific demographic of people within the Social Media environment. What do I mean? Well content is king as we all know, and content created by your peers is generally given a lot more weight then corporate messages, at least in the digital world. So go after the poeple who can do this for you - bloggers and Social Media advocates. This isn't something that hasn't been thought of; I'm not professing to have come up with this idea. I do however think it's a very good method of promoting yourself through the best channels available to you, in one of the most credible fashions. Of course I have a great example of this being done. Experience Commerce, a social media agency based in Mumbai, recently launched a new campaign for the Mitsubishi Cedia called The Great Driving Challenge. The campaign is described as "[a] kind of a reality show on the web; where web, mobile, travel, automobile and competition are nicely woven together". 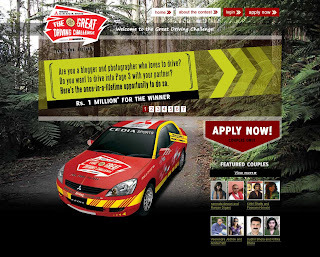 The Great Driving Challenge is a competition where couples (1 male and 1 female) compete to win Rs1,000,000 by blogging and tweeting for 12 days while they are travelling. The campaign creates a huge amount of UGC all about Mitsubishi Cedia, including votes and testimonials about driving it. So ultimately when you go online and search for the car, what you see is a huge amount of complimentary reports. The campaign is also supported by a full suite of online and offline advertising, as well as a number of clever user interactive activations in shopping centers. The benefit from a campaign like this is huge - if you have multiple people all creating content about your product or brand across a wide collection of Social Media platforms, you end up with more positive press and user endorsements then you can shake a stick at. In the case of Ireland you also have a method of utilising Social Media without the need for an extremely large population (and yes I know the population of India before anyone is too smart - but this type of campaign is not dependent on a huge population). The key to a campaign like this is to get on board that small, select, key group. There is, however, a very important thing to consider. I cannot be bought, and I would hope that none of the other bloggers I know could be bought either. So if you expect me to write about your product or brand, expect an honest response. If your product or brand don't hold up, you may be facing a torrent of bad online coverage.